Pantone's Marsala is one of those "love it or don't care for it" colors. And let's be honest, at a glance, it's a bit out of place in the wedding world. It looks right at home for interior designers, but joy-filled weddings all year round? Nah, not so much. Well, until you finish reading this, that is! As the anchor of inspiration, "red" barns actually turn to Marsala tones thanks to the sun, so it becomes a great option for couples wanting to pull in this 2015 color for an elegant, rustic wedding. When you have a barn, you have a field, and with a field comes the strawberries. And when you see the word strawberry here in Hampton Roads, you cannot not think of the Pungo Strawberry Festival every May! For the past 32 years, local strawberry lovers descend upon Virginia Beach farms to pick their own fresh fruit, partake in festival activities, and enjoy a variety of strawberry treats. There's nothing like the thought of sun-ripened fruit to shake away winter blues! 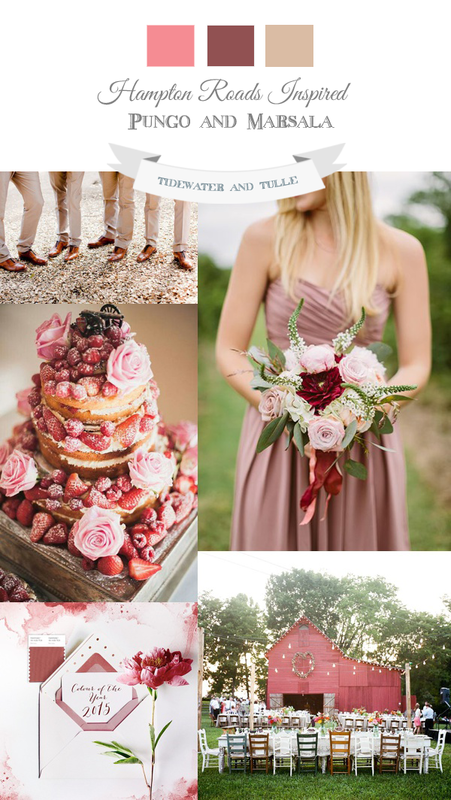 With Marsala snuggled in between brighter spring colors, it adds a gorgeous depth to wedding bouquets, cakes, and even details around reception tables... making this dubious color a winner for spring weddings!